Twists are great for digestion, spinal health, and calming your mind! Begin in Dandasana . As you extend actively through the right heel, inhale and bend your left knee bringing the sole of the foot in close to the left hip. On your next inhale, extend the right arm up towards the sky, lengthening the right side of your body. As you exhale, twist to the left, bending your right elbow. Draw the right elbow in between your left thigh and your torso, pressing your upper arm into your thigh and resisting back into the thigh with your torso to draw your spine upwards. 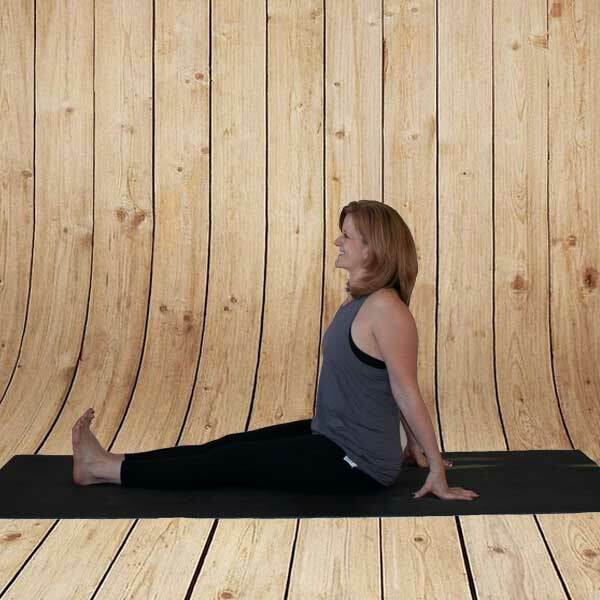 Hold this pose for 3 – 5 breaths, gently pressing the right hip towards the floor as you breathe. To deepen the twist, extend the fingers of your bent upper arm towards the floor to the outside of the sole of your foot, resisting the arm into the thigh and the thigh back into the arm. If sitting on the ground with the legs straight in front of you causes you to press your back away from a vertical position, place a blanket or small pillow under the sit bones. This slight lift will provide additional freedom in the low back, allowing you to access the twist.